Charity has finally inspired the soloist known as Han to give a talk on the secrets of the Star Wars universe. Harrison Ford is apparently known for having been tight lipped on most Star Wars topics since he filmed the first movie in the mid-1970s, but recently pried those lips open for a charity event. Ford gave a 30 minute talk on the franchise after a screening of Star Wars Episode V: The Empire Strikes Back to both celebrate the 30th anniversary of the film's release and to raise money for St. Jude Children's Research Hospital, during which he divulged a few interesting tidbits. While it may have seemed like the scenes on planet Hoth were filmed in the middle of Antarctica, in reality they were filmed in Norway just outside of a hotel during a blizzard. He said: "The conditions were so severe that they put the camera in the back door of the hotel we were staying at and shot out the door. So we were 12 feet from the hotel, out in the blizzard." The weather also changed Empire's shooting schedule so that Ford was unexpectedly forced to film there, even though his costume was meant only for the stage and not the depths of winter. "The one part I remember that was a little uncomfortable was Norway where we shot the snow scenes. I hadn't been expected to work there, so the costume that I had was built for the stage ... the only way to get to the set in the midst of a blizzard was on a snowplow train, which had a giant auger on the front of it and pushed through the snow and delivered me to the set. We immediately went to work." Did you also think that Chewbacca must have hurt his backside by sitting in the chair of the Millennium Falcon for days at a time? It turns out, he never was able to sit in the chair at all due to actor Peter Mayhew's height of 7 feet 3 inches at the time. "It was impossible for Peter, built of the scale that he is, to get in the seat. So every time you see Peter in the seat, he's been edited into it." I never thought of Wookie height reducing their employment opportunities, but it's a real problem. 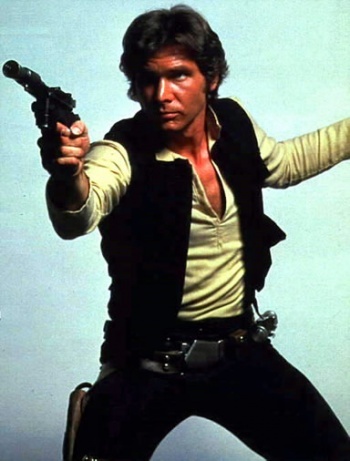 On the issue of Ford's desire to kill of Han Solo at the end of the original trilogy, he said : "I just thought that it would supply some emotional bottom, a grounding. George didn't agree, and so that did not happen." Further, he talked about how Star Wars accidentally saved him from the life of a carpenter after he'd given up acting. While working on a portico for Francis Ford Coppola, the casting director for Star Wars asked Ford to read with prospective actors. "After I read with probably 300 actors, they asked me if I would want to play the part, and I said sure," he said. The charity event raised $40,000 for St. Jude's. Ford related that he's not sure he understands even now why people would spend the $100-$175 ticket cost to hear him speak on Star Wars, but gives all the credit to John Williams' music and "some psychic vein" that he believes George Lucas tapped in to.